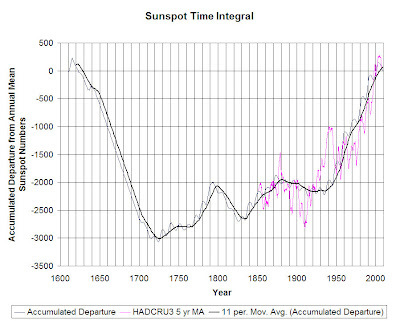 A paper published today in Annales Geophysicae reconstructs solar geomagnetic activity over the past 167 years and shows a decrease of the interplanetary magnetic field [IMF, an indicator of solar activity] from 1846 to the first part of the 20th century, followed by increase of approximately 50% in the IMF over the twentieth century. The new paper corroborates author M. Lockwood's prior peer-reviewed publications demonstrating that the Sun was particularly active in the latter 20th century. Fig. 7. Reconstructions of the near-Earth IMF, B, from geomagnetic data. The black line uses the new geomagnetic activity composite, IDV(1d) and the polynomial fit to B. The grey area surrounding this black line is the uncertainty band associated with using this polynomial fit derived using a Monte Carlo technique (see text for details). The red line shows the best reconstruction using a linear fit. The green line shows the SC10 reconstruction. Blue dots show the annual means of the observed IMF. Abstract. We present a new reconstruction of the interplanetary magnetic field (IMF, B) for 1846–2012 with a full analysis of errors, based on the homogeneously constructed IDV(1d) composite of geomagnetic activity presented in Part 1 (Lockwood et al., 2013a). Analysis of the dependence of the commonly used geomagnetic indices on solar wind parameters is presented which helps explain why annual means of interdiurnal range data, such as the new composite, depend only on the IMF with only a very weak influence of the solar wind flow speed. The best results are obtained using a polynomial (rather than a linear) fit of the form B = χ · (IDV(1d) − β)α with best-fit coefficients χ = 3.469, β = 1.393 nT, and α = 0.420. The results are contrasted with the reconstruction of the IMF since 1835 by Svalgaard and Cliver (2010). using the same instrumentation and procedures throughout. Abstract. We present a new composite of geomagnetic activity which is designed to be as homogeneous in its construction as possible. This is done by only combining data that, by virtue of the locations of the source observatories used, have similar responses to solar wind and IMF (interplanetary magnetic field) variations. This will enable us (in Part 2, Lockwood et al., 2013a) to use the new index to reconstruct the interplanetary magnetic field, B, back to 1846 with a full analysis of errors. Allowance is made for the effects of secular change in the geomagnetic field. The composite uses interdiurnal variation data from Helsinki for 1845–1890 (inclusive) and 1893–1896 and from Eskdalemuir from 1911 to the present. The gaps are filled using data from the Potsdam (1891–1892 and 1897–1907) and the nearby Seddin observatories (1908–1910) and intercalibration achieved using the Potsdam–Seddin sequence. The new index is termed IDV(1d) because it employs many of the principles of the IDV index derived by Svalgaard and Cliver (2010), inspired by the u index of Bartels (1932); however, we revert to using one-day (1d) means, as employed by Bartels, because the use of near-midnight values in IDV introduces contamination by the substorm current wedge auroral electrojet, giving noise and a dependence on solar wind speed that varies with latitude. The composite is compared with independent, early data from European-sector stations, Greenwich, St Petersburg, Parc St Maur, and Ekaterinburg, as well as the composite u index, compiled from 2–6 stations by Bartels, and the IDV index of Svalgaard and Cliver. Agreement is found to be extremely good in all cases, except two. Firstly, the Greenwich data are shown to have gradually degraded in quality until new instrumentation was installed in 1915. Secondly, we infer that the Bartels u index is increasingly unreliable before about 1886 and overestimates the solar cycle amplitude between 1872 and 1883 and this is amplified in the proxy data used before 1872. This is therefore also true of the IDV index which makes direct use of the u index values. Don' tell Leif Svalgaard, he might blow a gasket. The hyperlink in text does not work. It's malformed. I should have said it's the first hyperlink in the first paragraph which is malformed. It seems Lockwood is back on track to opposing Svalgaard. 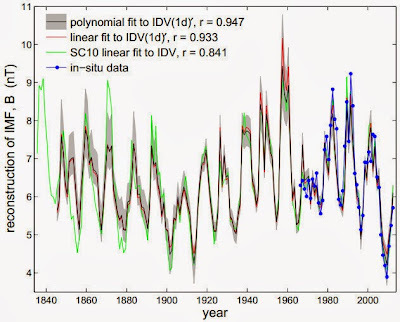 This is another paper that seriously questions Svalgaards data in his attempt to flatten the solar record. 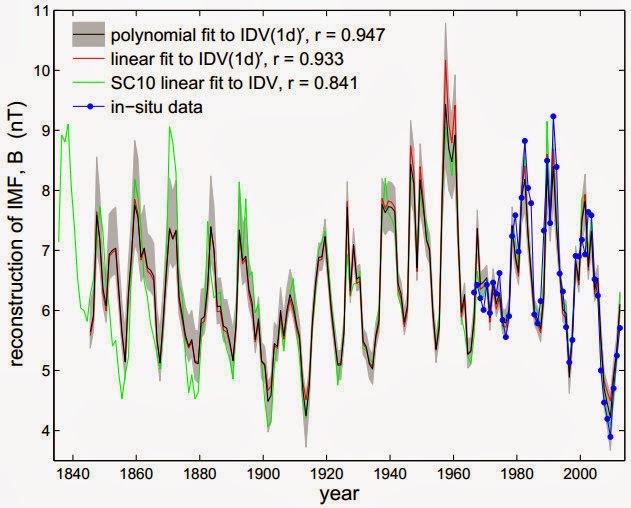 The recent Loussu et al paper also slams Svalgaard's claims the early GSN is wrong, instead the Wolf number needs adjusting down by 20% before 1848.